Is it ever going to STOP snowing?! The ground is now covered in a layer of ice then snow then more ice and now more snow. It's insanely slippery out there. Our driveway is like an ice rink! 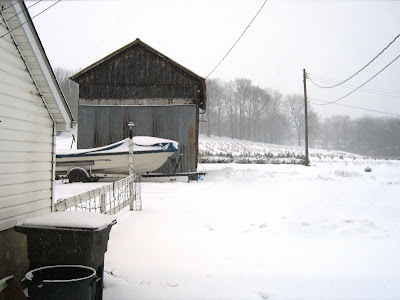 Here's a pic of the wash-house (left) and the boat (dinosaur) and the barn with one of the tree fields in the background leading up to the top of our hill where the pond is.